Rutgers’ Richard E. Riman has developed a new invention to prove that the future will see a wide variety of composite materials that are expected to be cheaper, lighter, stronger and greener for our planet. 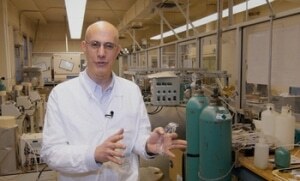 Riman, a renowned professor in the Department of Materials Science and Engineering in the School of Engineering, developed an energy-efficient technology capable of harnessing mostly low-temperature, water-based reactions. This invention brought about nine years ago by Riman has now resulted in his team being able to produce things in water that earlier were produced at temperatures much higher than those required to thermally decompose plastics. So far, the revolutionary technology has been employed to produce more than 30 different materials, including concrete that has the potential to store carbon dioxide, the key greenhouse gas connected to climate change. Other materials include several multiple families of composites that incorporate a variety of ceramics, polymers and metals whose behavior can be processed to resemble seashells, bone, wood and also steel. Riman, recently named a fellow of the National Academy of Inventors and holder of a number of patents, stated that a promising option is developing materials for lightweight automobiles. The materials could be used for engine, exterior and interior applications. Other materials could carry out improved magnetic, optical and electronic functions that replace mechanical ones. Ultimately, what we’d like to be able to do is create a ‘Materials Valley’ here, where this technology can start one company after another, small, medium and large businesses. It’s a foundational or platform technology for solidifying materials that contain ceramics, among other things. They can be pure ceramics, ceramics and metals, ceramics and polymers – a really wide range of composites. With 30 years of teaching experience in the Department of Materials Science and Engineering, Riman concentrates on developing ceramic materials under sustainable conditions. This refers to low energy with a low carbon dioxide footprint. Riman’s patented technology develops bonds between materials at low temperatures. This technology is called reactive hydrothermal liquid-phase densification (rHLPD), also referred to as low-temperature solidification. rHLPD has been used in producing a variety of ceramic composite materials at Rutgers, according to an article featured last summer in the Journal of the American Ceramic Society. Riman, who has a bachelor’s degree in ceramic engineering at Rutgers and a doctorate in materials science and engineering at the Massachusetts Institute of Technology, invented this new technology after analyzing how engineers densified Alaskan fields of ice and snow to develop airplane landing strips. I looked at how shellfish make ceramics at low-temperature, like carbonate crystals, and then looked at what people can do with water to make landing strips in Alaska and I said we should be able to do this with ceramics, but use a low-temperature chemical process that involves water. Even though Riman had this idea decades ago, he launched the technology only after climate change became a major problem. “When it became important to investors to see green technology developed to address carbon emissions in the world, I decided it was time to take this technology commercial,” he said. In 2008, Riman founded Solidia Technologies® in Piscataway, New Jersey. This is a startup company commercializing advanced, eco-friendly concrete and cement for infrastructure and construction. Riman highlighted that concrete is a $1 trillion market. Solidia Concrete™ manufactures products with greater durability and strength. Together with Solidia Cement™, Solidia Concrete™ can bring about reductions in the carbon footprint of concrete and cement by up to 70% and can also save almost 528.3 billion gallons annually, according to Solidia Technologies. The company’s concrete-based products comprise of hollow core building slabs, cinder blocks and roofing tiles. Concrete product manufacturers are being approached by the company to see if they are interested in licensing its products. When you can develop technologies that are safe and easy to use, it’s a game changer – and that’s just one of the many areas that we’re interested in pursuing. RRTC Inc., Riman’s second investor-funded start-up company, is developing improved composite materials for myriad uses. They include textile, automotive, agricultural, energy generation, electrochemical, pharmaceutical, biotechnology, biomedical, magnetic, optical, electronic, energy storage, body and vehicle armor, aerospace, and abrasive and cutting applications.